We are currently offering CNC conversion plans and DRO mounting hardware plans for the Sieg X2 mini mill and X3 small mill. Other plans are in the works. The "drivetrain" plans (i.e. ballscrew/acme leadscrew plans) will be out soon and will show you how to upgrade your existing stock screw/brass nut drivetrain in the X/Y axes with both ballscrew/ballnut and/or ACME leadscrew/acetal leadnuts for improved motion for your manual and cnc mill. DON'T WANT TO SPEND THE TIME TO MACHINE AND SPEND MONEY ON TOOLING FOR YOUR ONE-OFF CONVERSION AND UPGRADE BASED ON OUR PLANS? PREFER A KIT YOU CAN JUST BOLT-ON? LET US KNOW! 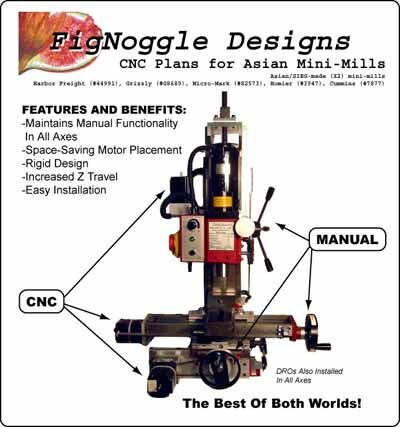 A Harbor Freight Mini-Mill CNC is shown above. Any version of the mini-mill built by Sieg works with our plans and kits.